Project. The initial scope of the project focuses on the period 1784 to 1918, covering several universities in the Habsburg realm, as Galician Jews traveled long distances from home to gain a medical education. In Galicia, there were two universities: the Jagiellonian University in Kraków and Lemberg/Lwów University. Others were situated outside Galicia (e.g., in Budapest, Vienna, and Prague). We plan to conduct a comprehensive survey of the available academic records, contracting local researchers to extract information pertaining to Jewish students and graduates (including midwives, surgeons, and medical doctors). We will provide the extracted information in a searchable format on the All Galicia Database. 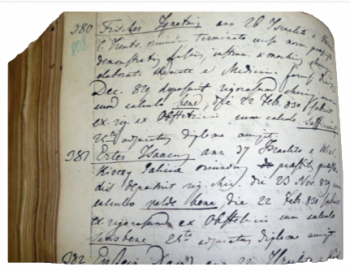 From 2017, the research has concentrated on archival surveys and indexing efforts covering Jagiellonian University, Lemberg/Lwów University, Pest University, and the German University in Prague. Background. Prior to the Austrian annexation of Galicia in 1772 only a few Jewish medical practitioners had academic degrees from universities (namely, from those in Italy and Prussia). At the end of the eighteenth century, the Habsburg emperor Joseph II’s toleration policies expanded educational access for Jews, coinciding with the founding of the Faculty of Medicine at Lemberg (Lwów) University in 1784. After first Jewish students graduated there (in surgery: 1786, and in medicine: 1804), the process continued in Kraków (in surgery: 1803, and in medicine: 1843). Other Galician Jews completed medical studies in the universities in Vienna (in medicine and surgery: from 1815 on) and Budapest (in surgery: from 1829 on). Jacob Rappoport “Judeus” (1772–1855): faded student record from Lemberg University in 1798. After graduating in 1804, he became one of the first university-trained Jewish doctors of medicine in Lemberg. In 1900, women were finally allowed to study medicine at universities in Austria-Hungary. It is noteworthy that a Jewish woman was the first female to graduate with a medical degree in Galicia – at Lwów University in 1904. By 1918, Jewish men and women comprised 30 percent of all students in the two Galician universities. Jewish women students were particularly overrepresented, forming a half of female student body in the closing years of Austrian Galicia. Trailblazers and rebels. Many Jewish physicians challenged existing stereotypes and expectations of the time. Their nonmedical activism, particularly in civic affairs or support of religious reforms (in the progressive movement), and contributions in the literary sphere all had a deep impact on the Jewish community of Galicia. They provoked social debates and often adopted “new” life styles. Isaac Erter (1792–1851): graduation record as a master surgeon from Pest University in 1830. Erter practiced in Brody; he became a popular Jewish satirical writer. Jewish medical practitioners displayed different cultural and linguistic affinities – from an initial acceptance of a dominant German influence, through the embrace of German culture, but with either Slavic nationalistic overtones or a focus on Hebrew language, to the early adoption of a Polish-Jewish identity. By virtue of their profession, they moved with ease between different linguistic, cultural, and religious segments of society, without abandoning their Jewish heritage. Throughout the period of Austrian Galicia (1772–1918), Jewish medical professionals were frequent harbingers of modernization within the traditional society. To learn more about Galician Jewish students and university records, please refer to a series of articles in the Galitzianer (June and September 2016; December 2017; December 2018). Prior issues of the journal can be found in the Members Portal. Contributions. To support the project, please direct your contribution to the “The Galician Medical Students/Doctors Project.” As always, we cannot guarantee in advance whether an original record set will be complete or whether it will contain information of interest to a particular donor. Financial donations to the project will allow us to advance this work and post lists of students and graduates, with their personal information if available, in the Members Portal exclusively accessible to the members of Gesher Galicia.